to the UN Secretary General. It is important to reach million signatures. Food and life for all without torture and death. 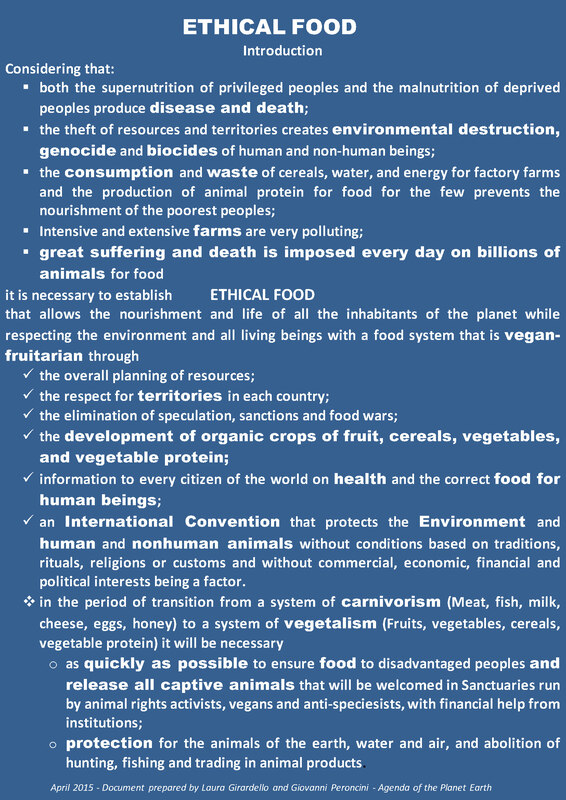 The document proposed by the Agenda of the Planet Earth called "Carta del Lago Cimino" (ETHICAL FOOD), expresses a position that is clearer, more practical and stronger: the increase in the cultivation of cereals, vegetables, fruits and vegetable protein in place of animal protein to abolish hunger, torture and massacres of animals used for food production, with waste of energy, water and cereals. After all human beings are not carnivores but frugivorous in their anatomy and physiology. Here you can sign the "Charter of Lake Cimino" (“Carta del Lago Cimino”), written by Agenda of the Planet Earth that proposes a type of power right and proper for those who want a future without hunger, and without the torture and death of human and non-human creatures.